I haven’t got to see it yet because I am just hitting Calif. and the test site was in Dallas. 5-30-08 I just had an online meeting with George Cresto of MyDealerLot™ and I am really excited about the possibilities that his system has and the positive implications on the auto transport industry. What really caught my attention was that they have successfully tested at an Adesa auto auction and that this has the potential to roll out to all of the Adesa auctions. They also do dealerships but I think we will see much more benefit at the auctions. 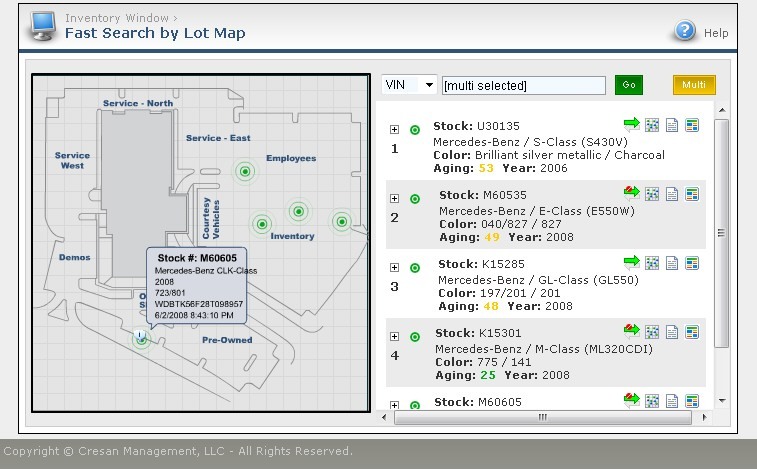 Since this is a web-based application and they have different login levels available they can have a login level for a dealer or his transporter to locate his cars on the lot by VIN number. The number of trucks that are computer equipped is rising rapidly and this system has the capability to allow the driver and/or his dispatcher to get real-time location of the vehicle they are trying to deliver even if it is moving! When a car is stationary it’s location is confirmed every 10 minutes but if it is moving it is updated every second. I think we have all left an auction more than once with an empty spot on our load because a car could not be located. Not only does that kill your profit on your load but that also hurts the dealer because he doesn’t get his vehicle in a timely manner. I hope that Adesa extends access to at least the transporters that are represented at the auctions. Just think how much time and frustration could be saved if the driver could see at the touch of a button the location of his cars before he even pulls out his ramps. He will know instantly if his cars have been pulled or not. This entry was posted in Auto Transport and tagged Adesa, manheim, RFID, technology. Bookmark the permalink.